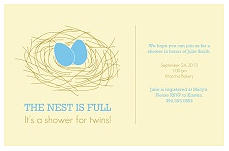 Where to find the cutest baby shower invitations for twins and multiples. Featured invitations are from: purpletrail.com (top row), tinyprints.com (left), and paperculture.com. Do you want see reviews and links for each store? 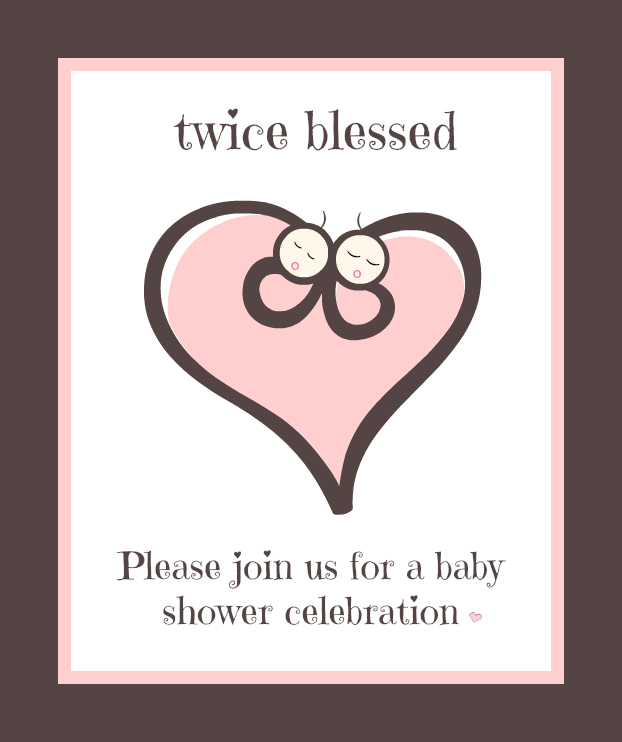 Go to all invitation ideas. 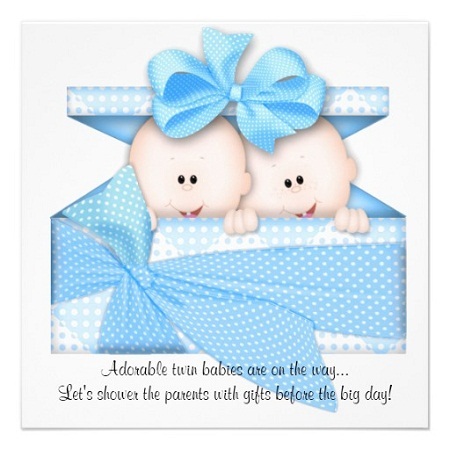 Paperlicious.com, has one of the largest, “Twin Baby” collections available online. The company is a growing e commerce; gaining popularity through happy customers, and high standards. 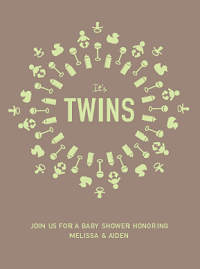 If I were planning a twin baby shower- I would be on this site, for sure! 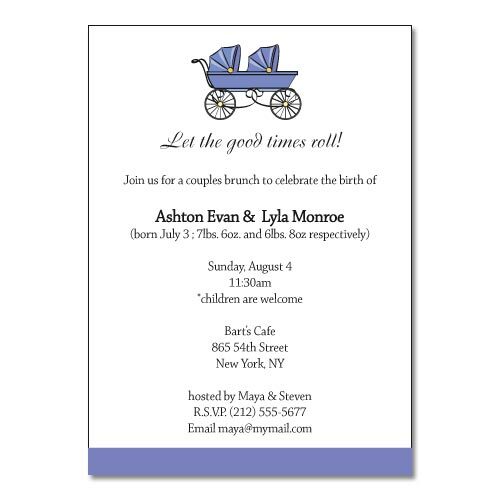 Indie sites- CafePress, and Zazzle are abundant with, baby shower invitations for twins. There’s amazing talent posted all over these two sites. What to keep in mind: Read reviews, purchase policies, and other disclosures, before you buy. Artists’ post their graphic designs. Customer chooses and customizes graphic. The image is purchased and printed on the item of the customers choosing. This is the fastest way to get the invites into your hands. However, it’s not always the quickest way to send them out. You’ll need to print the party details yourself. While you’re running errands- don’t forget to check the stationary isles of, the pharmacy, grocery store, office supply store or a local gift shop. It’s a great way to find unique and discontinued invites. It’s also a great solution when you’re, short-on-time. Picmonkey is the, “bomb” in editing websites. I’ve made dozens of designs and edits with their free software. I’ve posted a link on my freebies page. If you’ve got it, flaunt it! For anyone with the, “crafting” gene- there’s no end to what you can create. 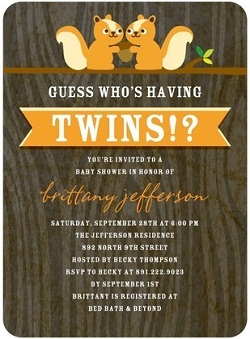 Double sided invitations or anything that’s doubled, should work. Baby icons, a stork carrying two babies, or twin baby animals- just to share a few.